Mouse anti Human CD326 antibody, clone MOC-31 (MCA2162XZ) used for the detection of CD326 positive cells by immunohistochemistry on formalin fixed, paraffin embedded prostate tissue sections. 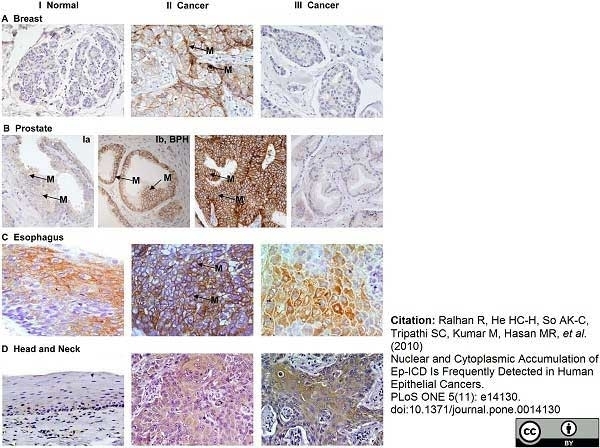 Immunohistochemical analysis of Ep-ICD and EpEx in prostate tissues. Panel shows (a) Nuclear/Cytoplasmic Ep-ICD immunostaining in (I) Normal, (II) BPH, and Prostate Adenocarcinoma: (III) Gleason Score <7, (IV) Gleason Score = 7; and (V) Gleason Score >7. Panel (b) Membrane EpEx immunostaining in (I) Normal (II) BPH, and Prostate Adenocarcinoma (III) Gleason Score <7, (IV) Gleason Score = 7; and (V) Gleason Score >7. Arrows show nuclear (N) Ep-ICD staining and Membrane (M) EpEx staining (Original Magnification x 400). Nuclear Ep-ICD Expression Is a Predictor of Poor Prognosis in “Low Risk” Prostate Adenocarcinomas. Mouse anti Human CD326 antibody, clone MOC-31 (MCA2162XZ) used for the detection of CD326 positive cells in tumor tissue by immunohistochemistry on formalin fixed, paraffin embedded tissue sections. Immunohistochemical analysis of EpEx, Ep-ICD and β catenin in thyroid cancer. The ATC did not show detectable membranous EpEx staining (IA); all the other subtypes of TC analyzed and normal thyroid tissues showed varying levels of plasma membranous EpEx staining (IB-IF). Nuclear Ep-ICD staining was observed in undifferentiated and poorly differentiated TC (IIA-IIC, and IIF), but not in well differentiated TC and the adjacent normal thyroid tissue (IID, IIE). Correlated with nuclear Ep-ICD staining, nuclear or cytoplasmic β catenin staining was observed in aggressive TC (IIIA-IIIC, and IIIF), while membranous staining was observed in the less aggressive TC and the adjacent normal thyroid tissues (IIID, IIIE). Panels A, B and F- I and II, C and F III- original magnification × 40; panels A III, B III, C, D, E - I and II, D and E III- original magnification × 20. The abbreviations M, C, and N denote membranous, cytoplasmic and nuclear localization of the proteins. From: Ralhan R, Cao J, Lim T, Macmillan C, Freeman JL, Walfish PG. EpCAM nuclear localization identifies aggressive thyroid cancer and is a marker for poor prognosis. BMC Cancer. 2010 Jun 25;10:331. 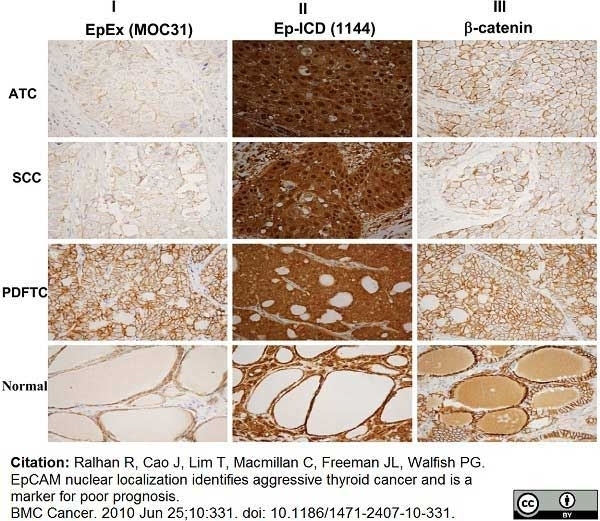 Differential immunohistochemical expression of EpEx, Ep-ICD and β-catenin proteins in different regions of an ATC tumor with varying degrees of aggressive tumor pathology. No membranous EpEx staining was observed in the ATC tissue section (IA), faint membranous EpEx staining in tissue section showing squamous cell carcinoma (IB), membranous EpEx staining in both poorly differentiated TC section and the adjacent normal thyroid tissue section (IC, ID). 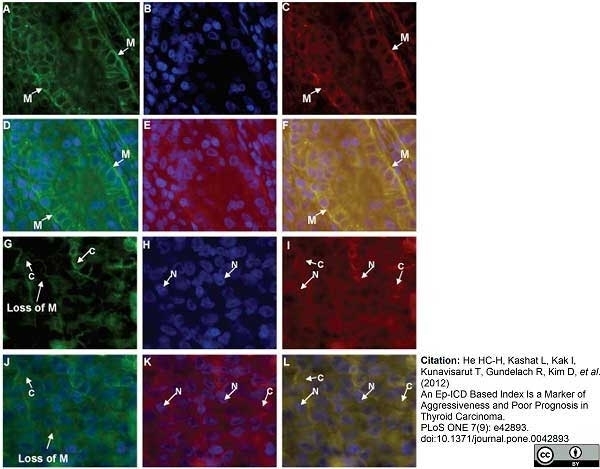 Nuclear and cytoplasmic Ep-ICD staining in undifferentiated and poorly differentiated TC tissue sections (IIA-IIC), membranous and cytoplasmic staining in the adjacent thyroid normal tissue (IID). Nuclear and cytoplasmic β catenin staining in ATC section (IIIA), membranous β catenin staining in different regions of this tumor with varying degrees of aggressive tumor pathology (IIIB-IIID). A-D, original magnification × 10. From: Ralhan R, Cao J, Lim T, Macmillan C, Freeman JL, Walfish PG. EpCAM nuclear localization identifies aggressive thyroid cancer and is a marker for poor prognosis. BMC Cancer. 2010 Jun 25;10:331. Mouse anti Human CD326 antibody, clone MOC-31 (MCA2162XZ) used for the detection of CD326 positive cells in epithelial tumor tissue by immunohistochemistry on formalin fixed, paraffin embedded tissue sections. Immunohistochemical analysis of EpEx expression in epithelial cancers. The photomicrographs depict MOC31 stained membrane EpEx in epithelial cancers. The panel I shows low level of membrane EpEx expression in normal breast (A) and prostate (B, Ia), BPH (B, Ib), and normal esophagus (C) and head and neck (D) tissues. The corresponding cancer tissues depicting increased level of EpEx in the membrane are shown in panel II (A–D). In contrast many of the cancer tissues of each cancer type showed absence of membrane EpEx (panel III, A–D). Original magnification ×400. From: Ralhan R, He HC-H, So AK-C, Tripathi SC, Kumar M, et al. 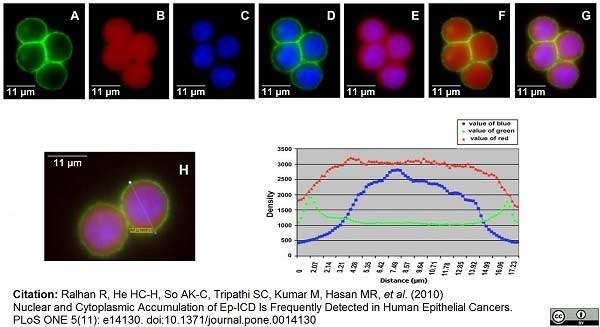 (2010) Nuclear and Cytoplasmic Accumulation of Ep-ICD Is Frequently Detected in Human Epithelial Cancers. PLoS ONE 5(11): e14130. Mouse anti Human CD326 antibody used for the detection of CD326 positive cells in epithelial tumor tissue by immunohistochemistry on formalin fixed, paraffin embedded tissue sections. Immunohistochemical analysis of EpEx expression in epithelial cancers. Membrane EpEx expression was observed in all the epithelial cancers. Panel I shows intense membrane EpEx in colon cancer (A), liver (B), bladder (C), lung (D), ovarian (E) and pancreatic (F) cancer. The panels II A–F show reduced or absence of membrane EpEx in a subset of each of these epithelial cancers. Original magnification ×400. EpEx immunohistochemical analysis in epithelial cancers control tissues. The negative control photomicrographs are shown. 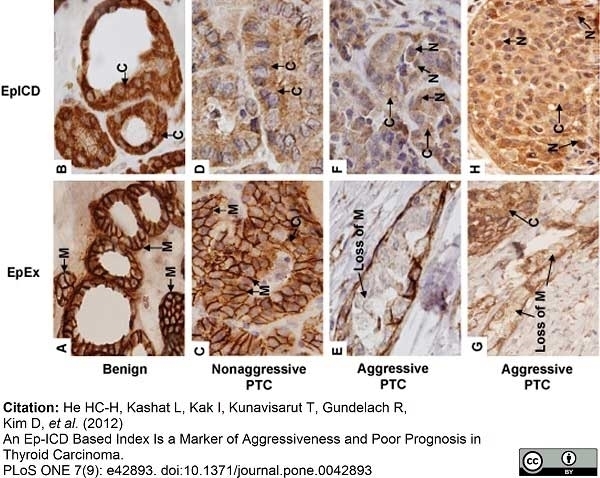 HNSCC (A), prostate cancer (B), colon cancer (C), breast cancer (D), ESCC (E) and normal esophagus (F); panels G and H are positive controls for EpEx staining. Original magnification ×400. Nuclear and Cytoplasmic Accumulation of Ep-ICD Is Frequently Detected in Human Epithelial Cancers. Fluorescence immunostaining in CX-1 cells with anti-EpEx (MOC31) and anti-Ep-ICD antibodies. Secondary antibodies are FITC-anti-mouse (green) and TRITC-anti-rabbit (red). A) EpEx; B) Ep-ICD; C) DAPI; D) EpEx and DAPI (A&C merged); E) Ep-ICD and DAPI (B & C merged); F) EpEx and Ep-ICD (A & B merged); G) EpEx, Ep-ICD, and DAPI (A, B, C merged); I) Measurement of the density of three colors across the line in the cells in H.
Mouse anti Human CD326 antibody, clone MOC-31 (MCA2162XZ) used for the detection of CD326 staining by immunohistochemistry of formalin fixed, paraffin embedded tumor tissue sections. Immunohistochemical analysis of EpEx and Ep-ICD expression in papillary thyroid carcinomas and benign tissues. The representative photomicrographs show immunostaining of EpEx and Ep-ICD in paraffin-embedded thyroid benign nodule goiters, non-aggressive PTC and aggressive PTC tissues. Strong membranous EpEx immunostaining was observed in benign cases (A) and non-aggressive PTC tissues (C); reduced staining of membrane EpEx was observed in aggressive PTC cases (E, G). The benign thyroid nodules and non-aggressive PTC (D) showed predominant cytoplasm localization of Ep-ICD and no detectable nuclear Ep-ICD staining (B, D), while the aggressive PTC cases showed strong nuclear and cytoplasmic Ep-ICD accumulation (F, H). M, membrane staining; C, cytoplasmic staining; N, nuclear staining; Loss of M, loss of membrane expression. Original magnification × 400. An Ep-ICD Based Index Is a Marker of Aggressiveness and Poor Prognosis in Thyroid Carcinoma. Mouse anti Human CD326 antibody, clone MOC-31 (MCA2162XZ) used for the detection of CD326 staining by immunofluorescence on formalin fixed, paraffin embedded tumor tissue sections. Fluorescence immunostaining with anti-EpEx and anti-Ep-ICD antibodies in aggressive and non-aggressive papillary thyroid carcinomas. Secondary antibodies are FITC-anti-mouse (green) and TRITC-anti-rabbit (red). A-F images from a non-aggressive PTC; G-L Images from an aggressive PTC. A,G) EpEx; B,H) DAPI; C, I) Ep-ICD; D) EpEx and DAPI (A & C merged); E) Ep-ICD and DAPI (B & C merged); F) EpEx, Ep-ICD, and DAPI (A, B, C merged). J) EpEx and DAPI (G & I merged); K) Ep-ICD and DAPI (H & I merged); L) EpEx, Ep-ICD, and DAPI (G, H, I merged). M, Membranous staining; C, Cytoplasm staining; N, Nuclear staining. Original magnification × 400. From: He HC-H, Kashat L, Kak I, Kunavisarut T, Gundelach R, et al. (2012) An Ep-ICD Based Index Is a Marker of Aggressiveness and Poor Prognosis in Thyroid Carcinoma. PLoS ONE 7(9): e42893. Mouse anti Human CD326 antibody, clone MOC-31 (MCA2162XZ) used for the detection of CD326 positive cells by immunohistochemistry on formalin fixed, paraffin embedded breast cancer tissue sections. 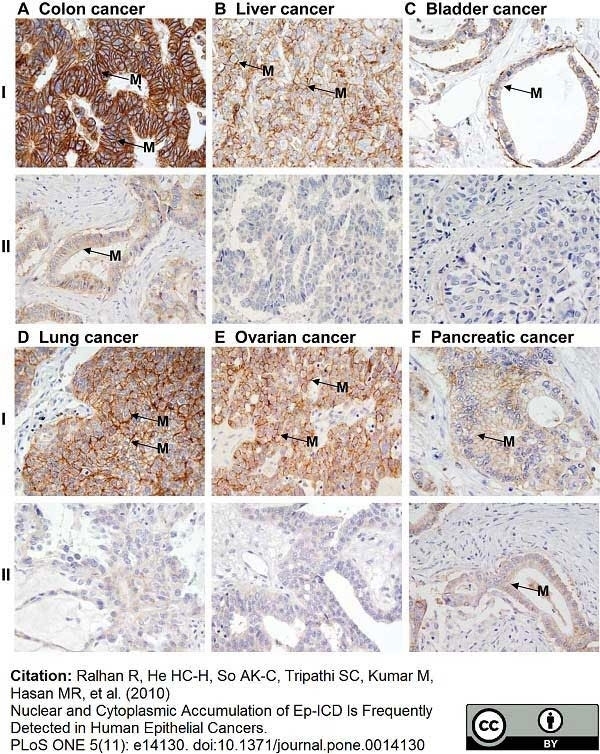 Immunohistochemical analysis of EpEx expression in breast cancer. 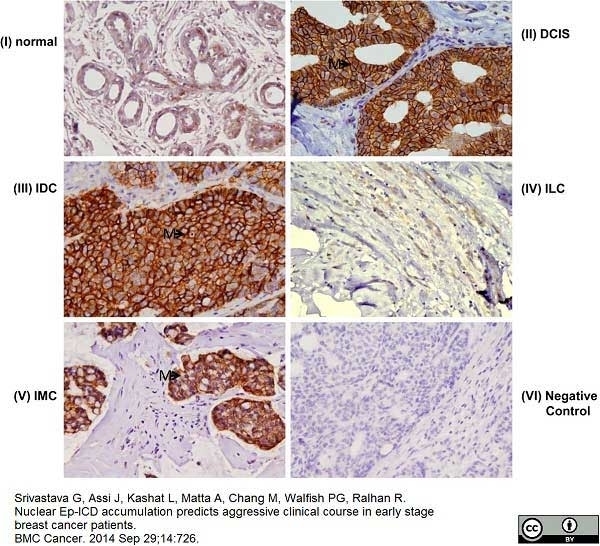 Expression of EpEx in (I) normal breast tissues; (II) DCIS; (III) IDC; (IV) ILC; (V) IMC; (VI) negative control breast cancer tissue incubated with isotype specific IgG showing no detectable immunostaining for EpEx. Membranous EpEx expression was more frequently observed in breast carcinomas compared to normal tissues, except ILC (original magnification × 400). The arrows labeled M depict membrane staining. From: Srivastava G, Assi J, Kashat L, Matta A, Chang M, Walfish PG, Ralhan R.
Nuclear Ep-ICD accumulation predicts aggressive clinical course in early stage breast cancer patients. BMC Cancer. 2014 Sep 29;14:726. 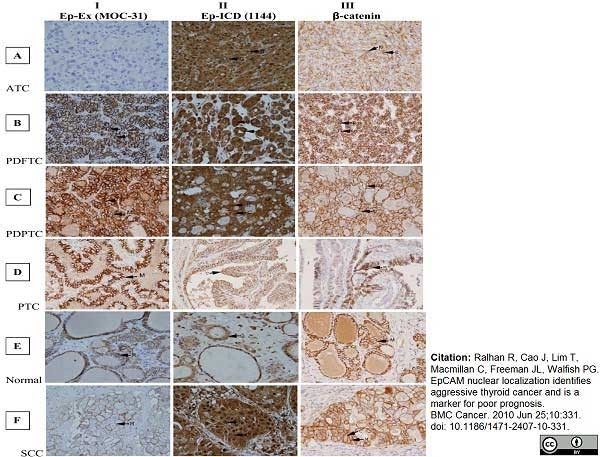 Immunohistochemical analysis of EpEx and Ep-ICD expression in papillary thyroid microcarcinoma. The representative photomicrographs show immunostaining of EpEx and Ep-ICD in PTMC. 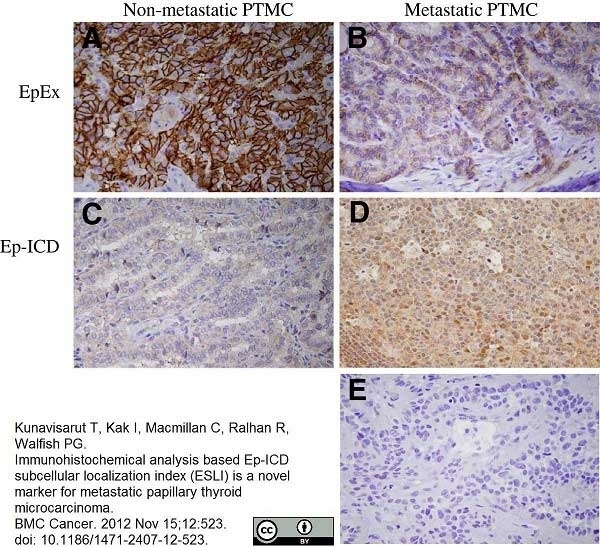 Strong membranous EpEx immunostaining was observed in the non-metastatic group (A), whereas decreased staining of membranous EpEx was observed in aggressive PTMC cases (B). The non-metastatic PTMC show predominant cytoplasmic localization of Ep-ICD and no detectable nuclear Ep-ICD staining (C), while the aggressive cases show nuclear and strong cytoplasmic Ep-ICD accumulation (D). (E) depicts the negative control. Original magnification x 400. From: Kunavisarut T, Kak I, Macmillan C, Ralhan R, Walfish PG. Immunohistochemical analysis based Ep-ICD subcellular localization index (ESLI) is a novel marker for metastatic papillary thyroid microcarcinoma. BMC Cancer. 2012 Nov 15;12:523. CD326 expression has been reported to be a possible marker of early malignancy, with expression being increased in tumour cells, and de novo expression being seen in dysplastic squamous epithelium (Spizzo et al. 2002). Souhami, R.L. et al. (1987) Antigens of small-cell lung cancer. First International Workshop. Ralhan R et al. (2010) Nuclear and cytoplasmic accumulation of Ep-ICD is frequently detected in human epithelial cancers. PLoS One. 5 (11): e14130. Ralhan, R. et al. (2010) EpCAM nuclear localization identifies aggressive thyroid cancer and is a marker for poor prognosis. Dankers, P.Y. et al. (2010) The use of fibrous, supramolecular membranes and human tubular cells for renal epithelial tissue engineering: towards a suitable membrane for a bioartificial kidney. Kawashima, R. et al. (2011) EpCAM- and EGFR-targeted selective gene therapy for biliary cancers using Z33-fiber-modified adenovirus. Int J Cancer. 129: 1244-53. Assi J et al. 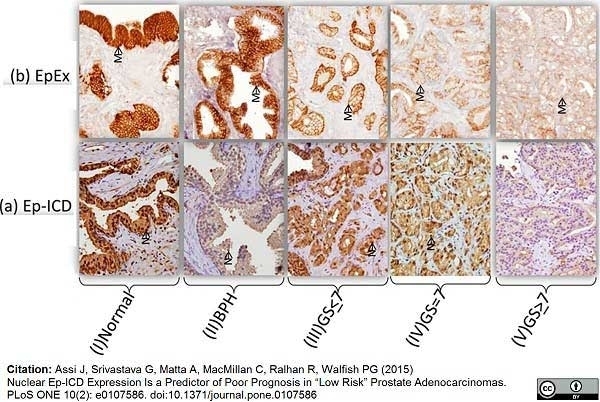 (2015) Nuclear Ep-ICD Expression Is a Predictor of Poor Prognosis in "Low Risk" Prostate Adenocarcinomas. PLoS One. 10 (2): e0107586. Kunavisarut T et al. (2012) Immunohistochemical analysis based Ep-ICD subcellular localization index (ESLI) is a novel marker for metastatic papillary thyroid microcarcinoma. He HC et al. (2012) An Ep-ICD based index is a marker of aggressiveness and poor prognosis in thyroid carcinoma. PLoS One. 7 (9): e42893. Srivastava G et al. (2014) Nuclear Ep-ICD accumulation predicts aggressive clinical course in early stage breast cancer patients.